How a team react when a game is lost can tell you a lot. Arsenal's response to impending defeat was to roll over for a tummy tickle and the upshot was a night of perfect symmetry. 5-1 to add to a 5-1 and an aggregate score of 10-2. It is the kind of scoreline that you have to look at for a while to really understand. 10-2. 10-2. Yes, really. Look away and look back and it will still be the same. Tuesday night's result didn't necessarily reflect the flow of this game. 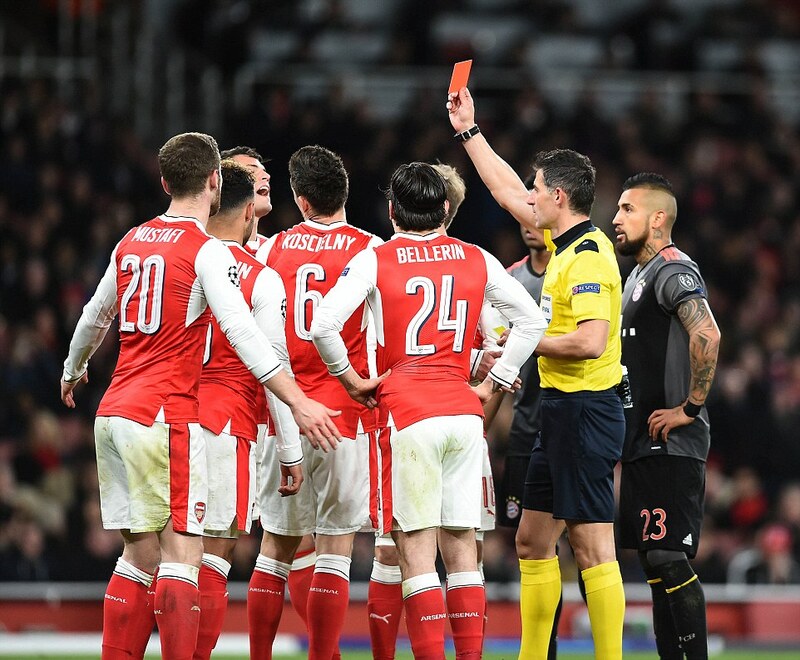 Arsenal were the better team for almost an hour and were in the lead until Laurent Koscielny was sent off for conceding the penalty that led to Bayern's equaliser. 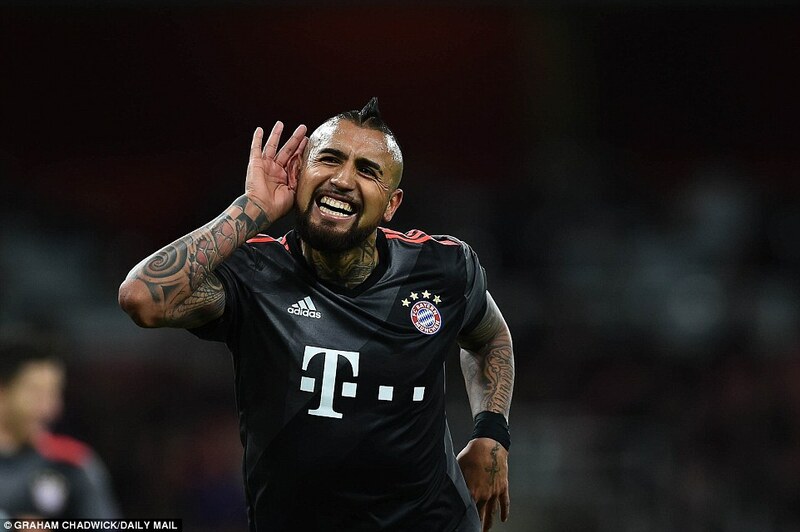 Midfielder Arturo Vidal cups his ear to the supporters after he scored two goals in just four minutes as Bayern sealed their win. But that fact makes this worse, not better. To get thumped on a bad day can happen to any team. But to take a shellacking when you were in control is another form of embarrassment altogether. But this is the world of the modern Arsenal. Even when they threaten to be good they can turn out to be dismally bad. That doesn't happen to many teams in sport but it does to this one. 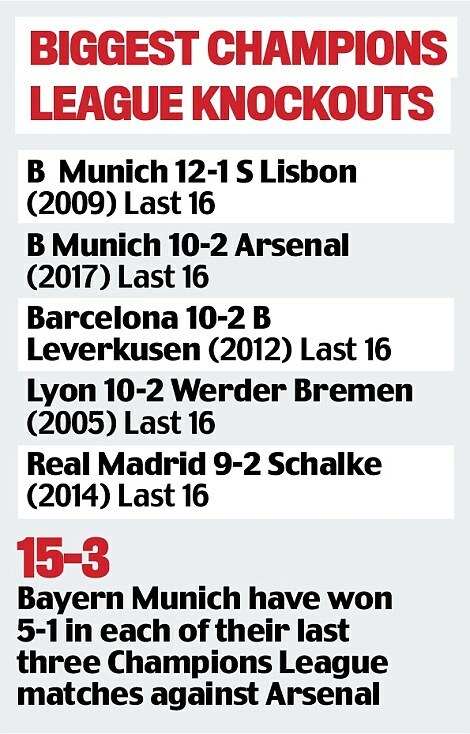 In Bavaria three weeks ago, Arsene Wenger's team were submissive. Here, they took that characteristic to unprecedented levels. After Robert Lewandowski scored Bayern's penalty the home team fell apart. They fell apart in terms of their organisation, their discipline and their collective understanding. More tellingly, they fell apart emotionally. Once the tie was essentially over, Arsenal's sense of who they are supposed to be left them altogether. 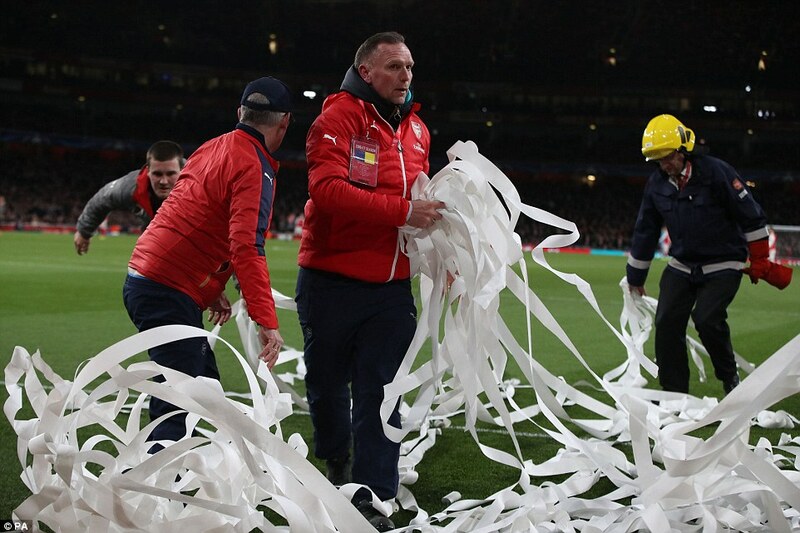 Wenger had called for his players to chase down their first-leg deficit with 'lucid rage' and they responded by raising the white flag. 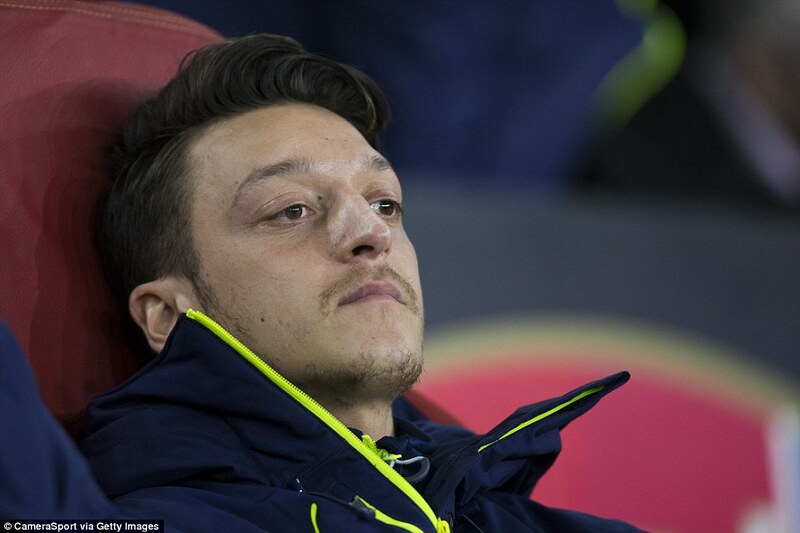 And this is what will kill Wenger. 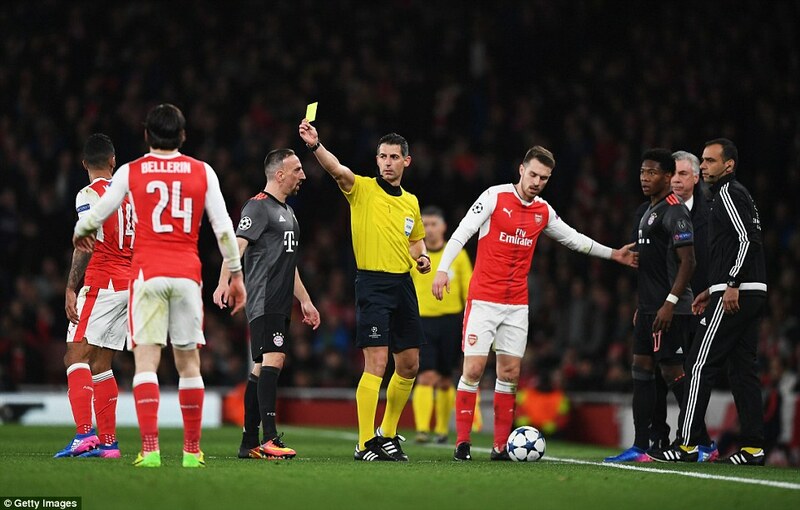 At full time, he looked daggers at Greek referee Tasos Sidiropoulos but the official's only crime was to show Koscielny a yellow card after his assault on Lewandowski and then correctly replace it with a red on the advice of an assistant. It was a weird moment but not definitive. 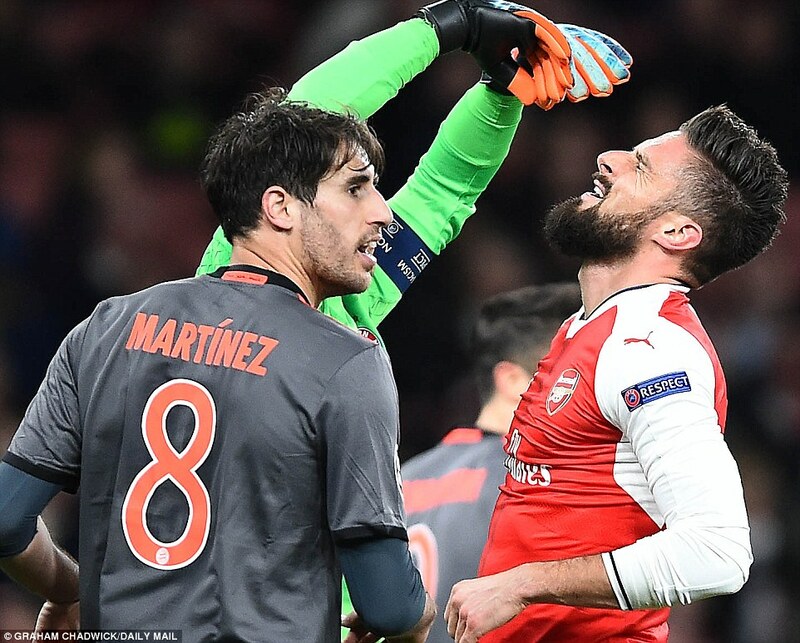 The definitive part of this wretched night was the way Arsenal responded and for all the words of recrimination, Wenger will know this. Managers can talk to their players in the week and can observe them train. But if they want to know what's really going on in their hearts and minds then they have to watch them play. Here Wenger saw a group that has lost its way. It is a group of footballers unfit for the physical and mental demands of the game at this level. As Wenger continues to mull over his future, he must ask himself how he has allowed this to happen. This was a strange night of football from start to finish. 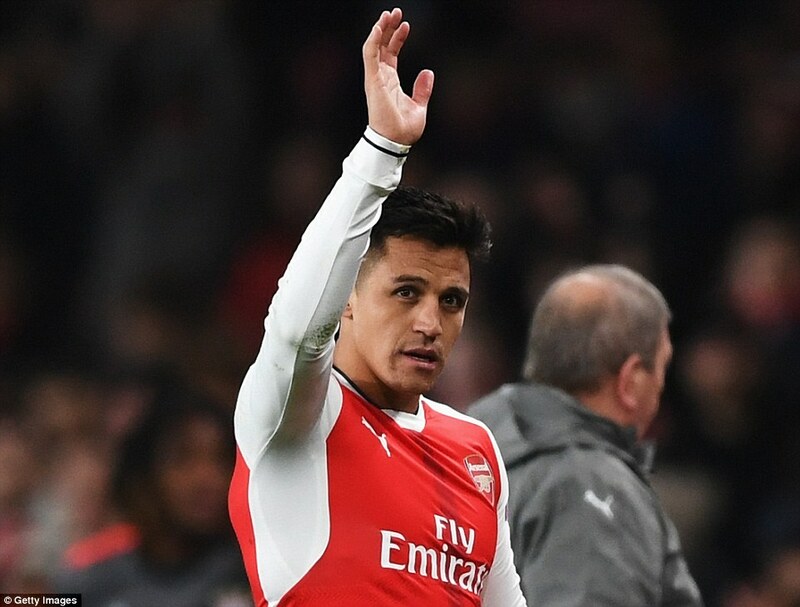 For the most part, there was no obvious animosity towards Wenger from the stands, nor towards his unhappy striker Alexis Sanchez. 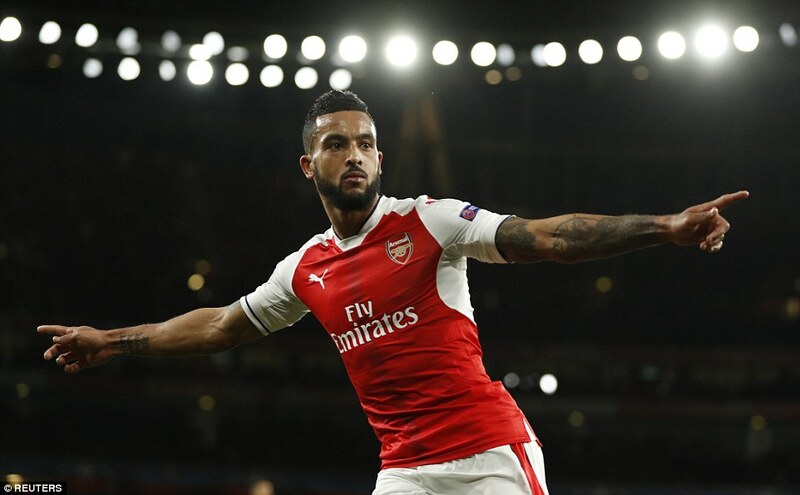 Indeed, when Theo Walcott burst through early on the right to place a blistering shot above Manuel Neuer there was a feeling that Arsenal were at least going to go out of this competition with some dignity and maybe even a second-leg victory. For the first half Arsenal were as Arsenal can be on good days. They were aggressive, fleet-footed and incisive. This was the Arsenal Wenger still dreams of. It's the version of his team that sustains him. 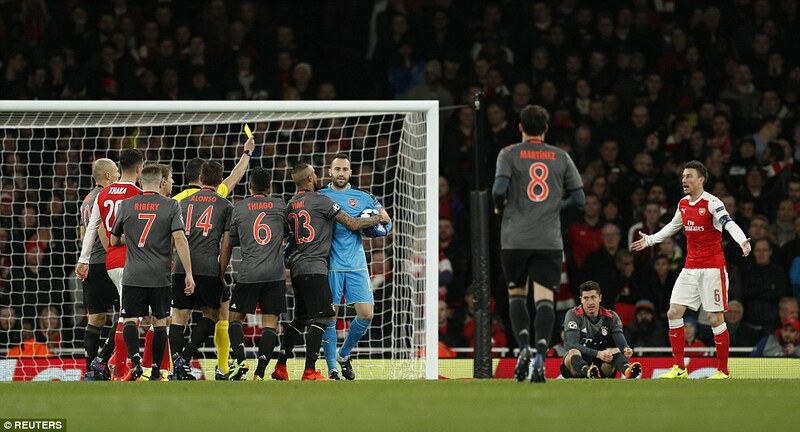 They could have had a penalty when Xabi Alonso felled Walcott but more crucially they really should have had a second goal shortly after the interval as an Aaron Ramsey cross dropped perfectly for Olivier Giroud seven yards out. Another goal at this point and we would have had a game on our hands, and Arsenal would have had a platform from which to reach for a miracle. 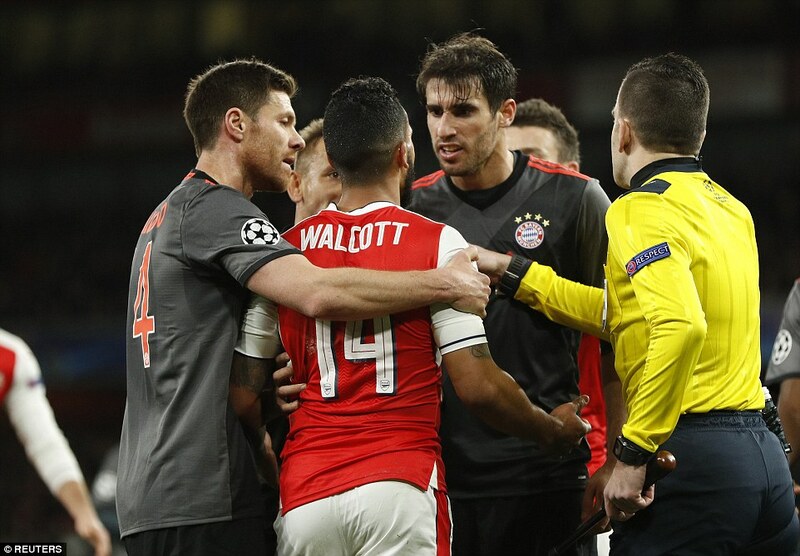 Walcott reacts angrily after an appeal for a penalty where he thought he was clipped by Xabi Alonso (left) was rejected. But Giroud is typical of the modern Arsenal. He is good but just not good enough. 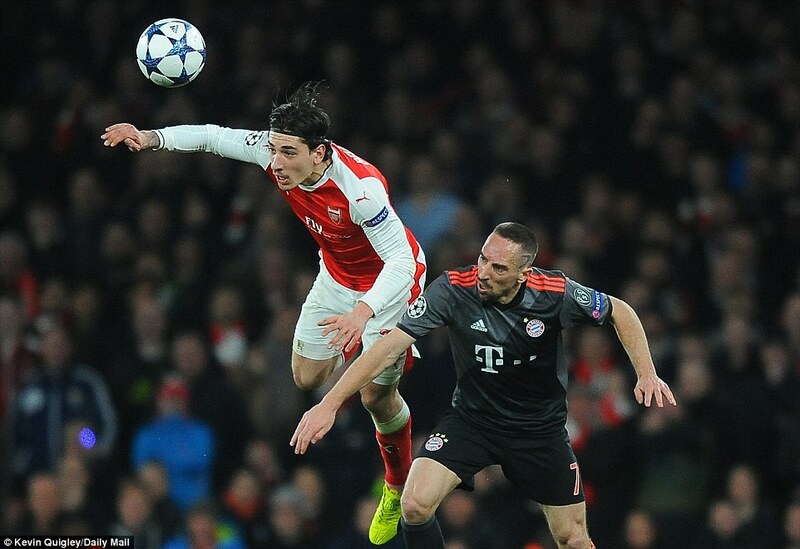 As if to demonstrate as much, he sent in a header that drifted weakly over the bar. Wenger continues to think Giroud is an asset, blinded by stats that mask the fact that he doesn't deliver when he absolutely needs to. 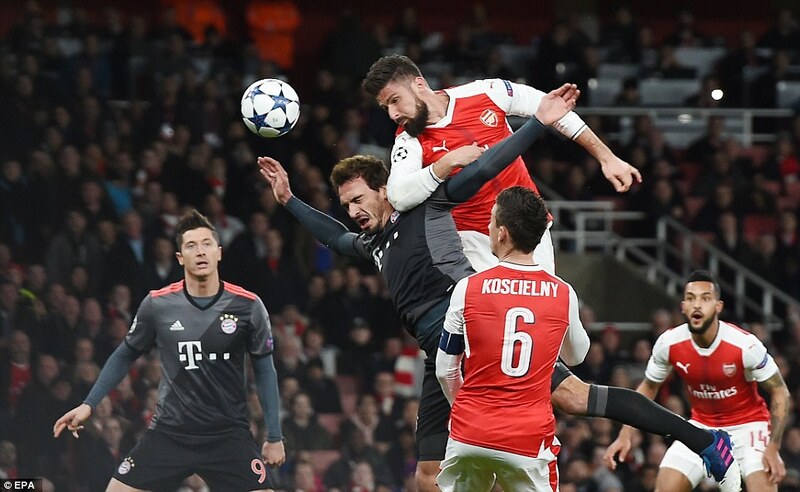 But here was evidence to the contrary and within six minutes Lewandowski was pushed over by Koscielny and the evening was turned on its head. 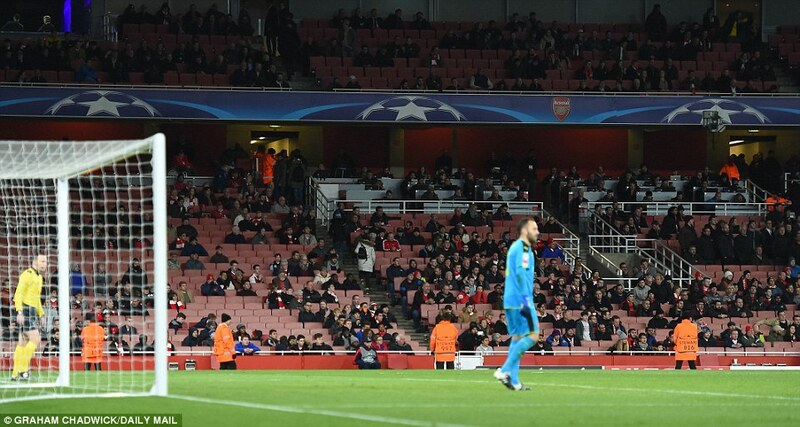 With hope gone and Arsenal's captain not far in its wake, it was no surprise that the air disappeared from the evening. 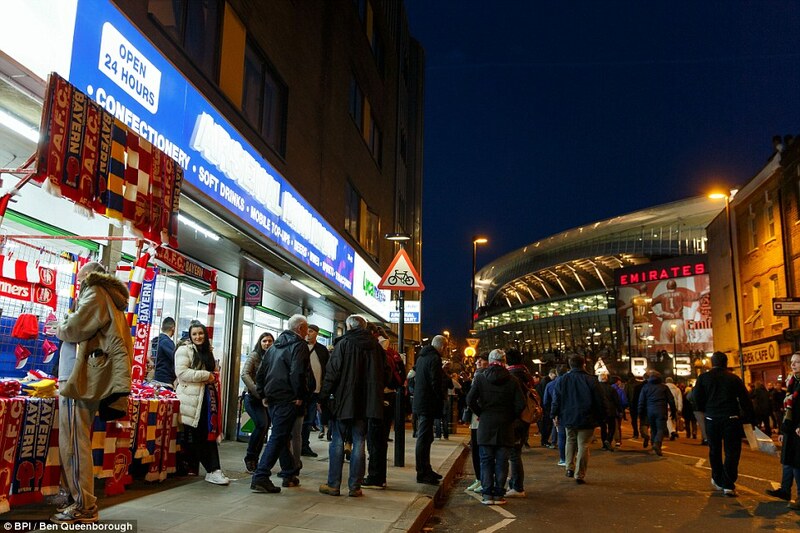 But Arsenal's subsequent capitulation was still unforgivable. Pride should have prevented what followed. Lewandowski goes down after being clipped by the defender as the striker got closer to Ospina's goal. 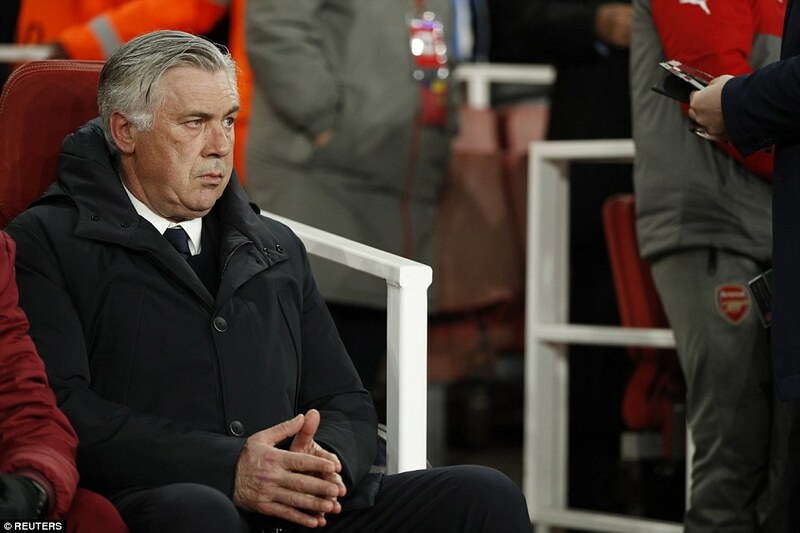 Bayern's goals flowed like water in the last 22 minutes as Arsenal sulked and then disengaged completely. 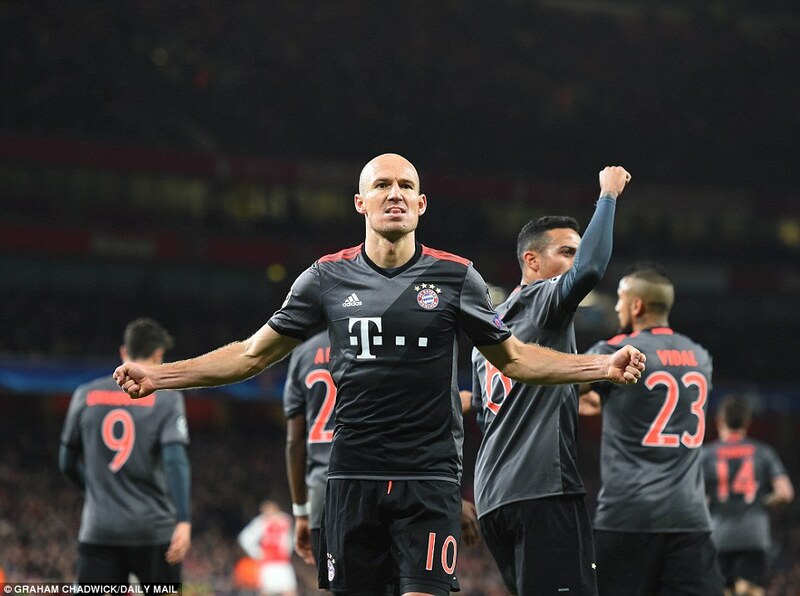 Sanchez should have tackled Arjen Robben but didn't and the Dutchman scored. 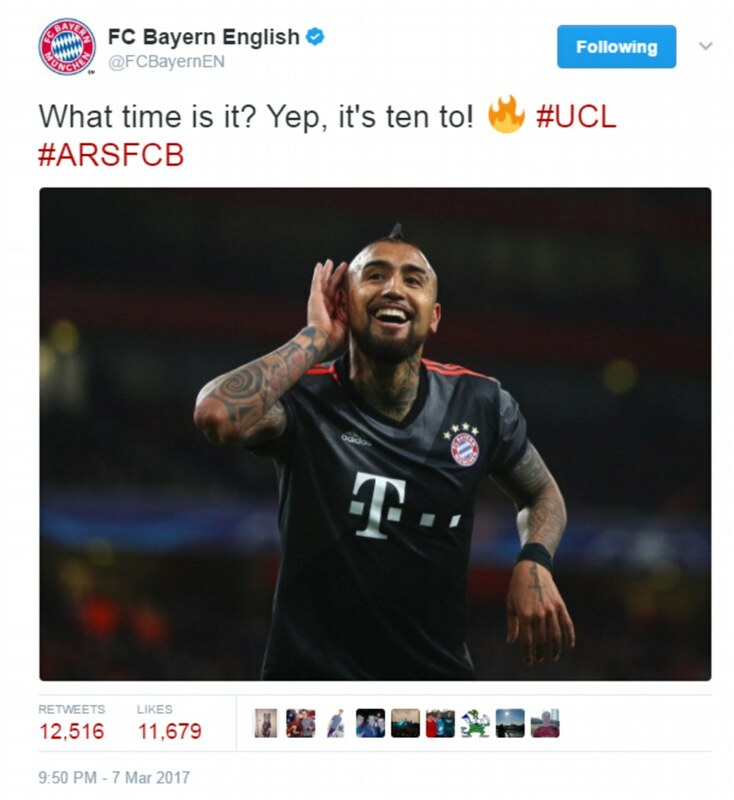 Then, in turn, substitute Douglas Costa and Arturo Vidal — twice — walked through Arsenal's open door and set about stealing the furniture. 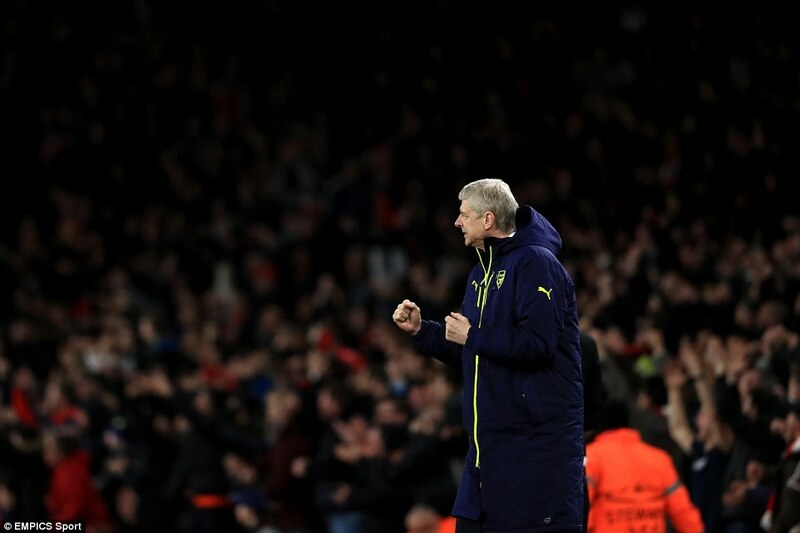 Afterwards Wenger described the match officials as 'scandalous'. 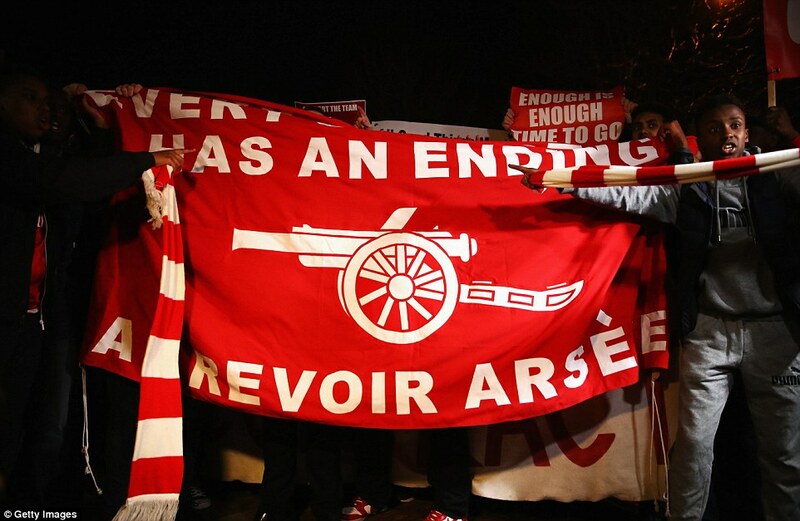 It was the perfect adjective but Wenger will know perfectly well it was aimed at entirely the wrong group of people. 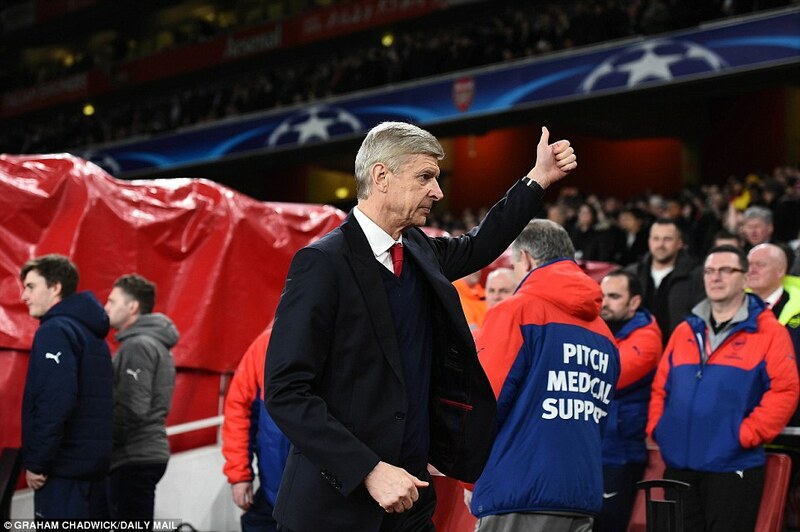 Wenger's players wrote their manager his own resignation letter for him on Tuesday night. He would be foolish not to read it. 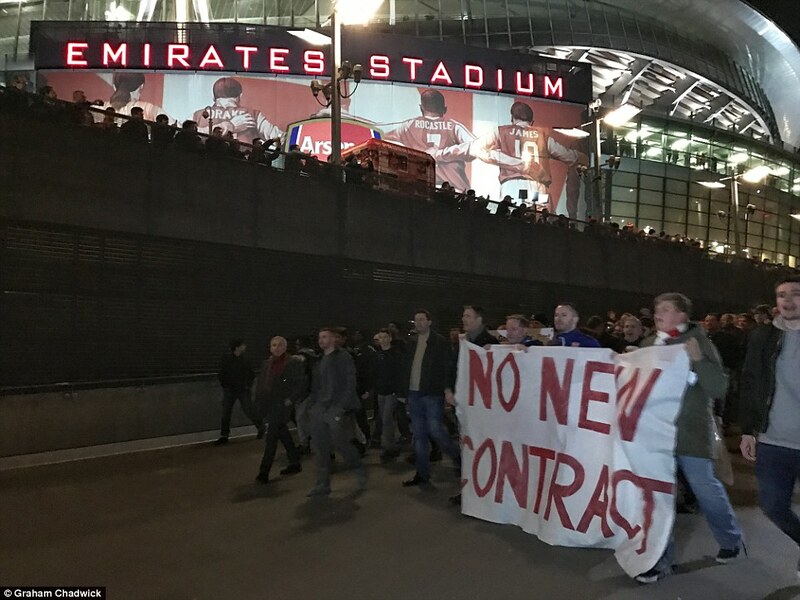 Supporters make their way to the Emirates ahead of Arsenal's Champions League last-16 tie with Bayern Munich.